The history of this Art Nouveau masterpiece dates to 1859, but its true Modernism appeal wasn’t realized until the beginning of the 20th Century when famous architect Lluís Domènech I Montaner did a complete renovation that can still be seen today. Modernist touches can be spied throughout the entire property, from its cascading patios and elaborate spiral staircase to a roaring alabaster fireplace and multi-story hanging gold lamps. Symbolism is everywhere welcoming guests to a past life where Barcelona artists changed the world’s outlook on what was possible in design. Today, the hotel combines modern amenities with its nouveau past and is an ideally located spot in the middle of the Raval neighborhood. Ask the hotel about special tickets and packages. Because it’s next to the Gran Teatre del Liceu, they often have tickets at a discount. Light wood floors lead to exposed original stone walls in the tastefully decorated rooms. There are a lot of balconies (so make sure you snag one) that look out onto the street below. The headboards are backlit with modern art pieces giving the room a shock of color and design. Inside the minibar you’ll find complimentary water, juice, and milk and there are tea kettles in all the rooms while suites have Nepresso machines. Most bathrooms have big rain showers with shimmering corrugated walls, raised sinks, and shaving mirrors. Bath products are by Ritual. The lobby is the most impressive part of the building with gray marble floors, ornate marble pillars with golden dragon lamps (the symbols for St. George, the patron saint of Catalonia) and high ceilings. A wrought-iron spiral staircase is original and elaborate, and as you walk up the marble steps you’ll see ancient mosaics encased in glass. Also off the lobby are the various patio spaces which range in color and design and provide odes of natural light into the building. Modernist symbols are everywhere, treating guest to small surprise messages. Ask the front desk to tell you what everything means! A small rooftop pool is surrounded by mosaic-tiled walls and black loungers. Open from 9 am to 1 am, the bar scene on the roof is a fun hangout worth exploring all year-long. There’s no dedicated spa, but in-room massages are available and there’s a single room that’s also outfitted with a massage table. Fonda España is the Michelin Bib Gourmand restaurant in the lobby and another striking example of modernist design. Original tiles and gold chandeliers line the rectangular-shaped hall where some of the finest and most inventive Catalan cuisine can be had. In the breakfast room, you’ll be treated to muralled walls of sea creatures against a parquet floor while you indulge in a hearty buffet. The lobby bar is dubbed Bar Arnau, named after the extraordinary alabaster fireplace depicting the lifespan of man and sculpted by renowned artist Eusebi Arnau. While you sip on signature cocktails, look around to see original wood-beamed ceilings and elaborate chandeliers from the beginning of the 20th Century. On the hotel’s roof is Alaire, a terrace bar that has live music Thursday through Saturday as well as a menu with tapas, sandwiches, and salads. Modern-design furniture is everywhere like the face-shaped white chairs that make for perfect Instagram posts. You can walk to so many great things from this location, it truly is ideal. You’re only a block from Las Ramblas (the most trafficked pedestrian area in town) as well as two minutes from the nearest metro stop. You can get to the water in about 10-minutes and there are taxis constantly cruising up and down the streets. One thing to note, the Parròquia de Sant Agustí is around the corner where a mission helps the homeless – at night it can be a little dodgy, but usually you have nothing to worry about. Pizza-lovers should definitely head to Frankie Gallo Cha Cha Cha (3-minute walk) for Neapolitan perfection. For tapas fans, check out Cañete (2-minute walk). Cocktail connoisseurs can’t go wrong at the cozy and casual Bar Marsella (4-minute walk). If you’re in a clubbing mood, head over to Moog (5-minute walk) where DJ sessions kick off at midnight and go till late. If you love Modernist history, this hotel is your ground zero. There are so many design touches, you’d almost need a tour guide to discover all the hidden messages and small symbols laced throughout. Beyond the Art Nouveau, the hotel itself is a fully renovated modern property with excellent service, a Bib Gourmand Michelin restaurant that’s worth splurging on, and a central location that gives you easy access to the entire city. 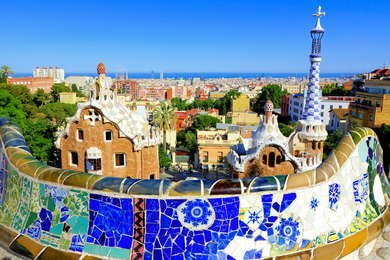 Combining history, culture, nightlife, and location, you’ll have a perfect perch to all that Barcelona has to offer.